Beside the collection efficiency, other optical characteristics have been monitored to evidence how much they are affected by geometrical deformations of the solar trough profile. The second study combines the consequences of mirror deformations with misalignment and tracking errors. The crucial optical features to be considered in examining alignment and sun tracking are angular misalignment and acceptance angle of the solar trough collector. In thermotropic systems with fixed domains scattering particles, which exhibit a sudden change of refractive index with temperature, are statically embedded in a matrix material. At low temperatures the layer is translucent, as the refractive indices of matrix and domain are almost equal. The differing temperature dependence of the refractive index for the components above the switching threshold causes the thermotropic film to turn opaque . 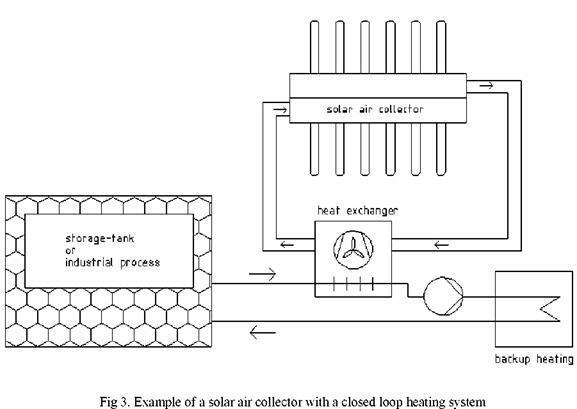 In general there are two types of applications for solar thermal air collectors. Open systems in which outdoor air can be heated up directly and circulation systems with a closed loop. In a closed loop application the heat can be used directly or if needed transferred to another medium by means of a heat exchanger like shown in figure 3. New composite absorbers were developed on aluminium and cooper substrates by spray pyrolysis technique. To enhance the heat-transfer process a thin (0.5 mm) sheet of high-thermal-conductivity material (Al, Cu) was used as substrate. For increasing the adherence properties, the aluminium surface was subjected to chemical rinsing in alkaline solutions (10-15 g/L NaOH, 30-50 g/L Na2CO3, 30-50 g/L Na3PO4). Afterwards the samples were anodized in nitric acid solution for 10 minutes at 3A. The copper substrate was mechanically polished with sandpaper No 800, and then washed with deionised water before each deposition. Tests shall be performed with system components installed in accordance with the manufacturer’s installation instructions. The collector shall be mounted in a fixed position facing the equator within a range of ±10 and located in such a manner that a shadow should not be cast onto the collector at any time during the test period. With roof mounted linear Fresnel collectors it is possible to provide industrial process heat of up to 200°C, which makes them well suited to power efficient absorption chillers. Two prototypes and two commercial units of the PSE linear Fresnel process heat collector were installed so far. The tests and measurements at the pilot solar cooling system in Bergamo show a reliable automatic operation and a typical efficiency of the PSE Fresnel collector of approx. 40% with respect to DNI at 180°C. The system is continuously operated since late summer 2006. In late 2007 and early 2008 the first commercial systems were commissioned in Spain and Tunisia. Both will be evaluated by the customers in the frame of research/demonstration projects. As shown in Fig. 6, an angle plate, bended as a sector of a circle, is screwed at the front side of the collector prototype. Over this guidance a chain with a tensioning mechanism is led, which can be driven by a step motor over a gearwheel. 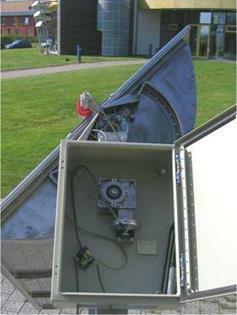 The step motor is placed together with the control chip in a cabinet at the front side of the carrier. The control chip receives the sensors’ signal, which is placed on the top side of the collector. If the irradiation is not vertical to the aperture section, the control chip receives a differing voltage of the two photo cells insight the sensor which activates the tracking. The motor stops when the sensors’ signal is again equal zero.